Not to be confused with World 1-1, Level 1-1, or Stage 1-1. Area 1-1 is the first course of Coaster Hills and the first course overall in Mario vs. Donkey Kong: Mini-Land Mayhem!. It also introduces the Red Girders, a primary gameplay element which is used to connect two adjacent rivets, creating bridges for Mini Mario and co. The level features two Mini Marios. 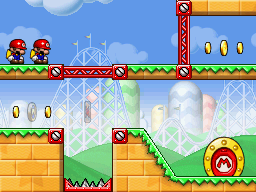 Both Mini Marios begin on a platform on the top left, with the exit door on the bottom right. In order to reach it, they have to go down a level by removing the Red Girder bridge on the top and reinstalling it at the bottom to block off the Spike Trap. A steep slant will ultimately lead the toys right into the exit. The M-Token is located just below the starting point, on a knoll at the left side of the stage. To collect it, the Mini Marios should simply be led there using a Red Girder bridge above the Spike Trap and a Red Girder wall. The Mini Mario Card is located directly adjacent to the M-Token. The Mini Marios should be guided to it in the same manner as the M-Token. In order to earn a trophy, the player must score 15100 points. In Plus Mode, the Mini Mario must be guided to the exit door first, followed by the Mini Toad. In order to earn a trophy, the player must score 14700 points. This page was last edited on September 18, 2018, at 03:49.